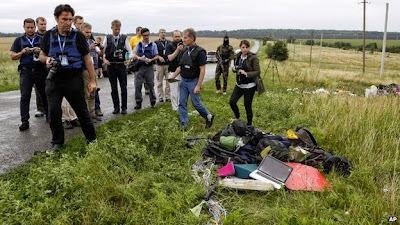 HRABOVO, Ukraine -- Ukraine has accused pro-Russian rebels of trying to destroy evidence of "international crimes" at the crash site of a Malaysia Airlines plane. 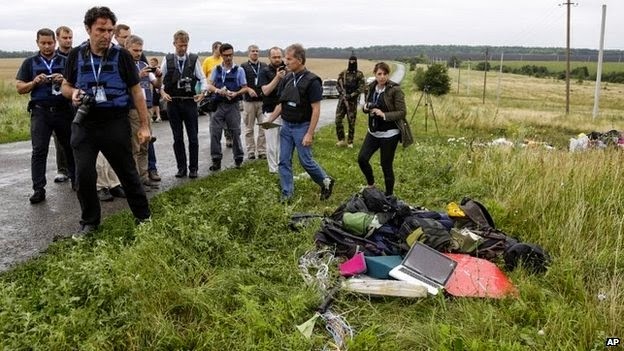 The 25-man observer team left the crash site after just over an hour. The government said the rebels led by Russia were preventing international representatives and its own experts from starting their investigation. It is believed flight MH17 crashed after being hit by a surface-to-air missile fired from a rebel-held area in east Ukraine on Thursday. All 298 people on board died. The Boeing 777 was flying from Amsterdam to Kuala Lumpur. It fell between Krasni Luch in Luhansk region and Shakhtarsk in the neighbouring region of Donetsk. Latest figures released by Malaysia Airlines show the plane was carrying 192 Dutch nationals (including one with dual US citizenship), 44 Malaysians (including 15 crew), 27 Australians, 12 Indonesians and 10 Britons (including one with dual South African citizenship, four Germans, four Belgians, three from the Philippines, and one each from Canada and New Zealand. In a statement, the Ukrainian government complained that "the terrorists" had taken 38 bodies to a morgue in the rebel-held city of Donetsk. It says the bodies were transported with the assistance of specialists with distinct Russian accents. It said the rebels were also trying to transport the plane's wreckage to Russia. Both Britain and the US are now publicly pointing the finger at rebels in eastern Ukraine and maybe Russia as well. Both say they think the Malaysian airliner was probably shot down by a missile fired from rebel-held territory - and perhaps with Russian help. Speculation that Ukrainian jets may have tailed the airliner before it crashed; colourful theories that maybe Ukrainian forces were really trying to target Putin's Presidential jet and got the wrong plane. The question is which version is shaping President Putin's thinking. And whose opinion will he bear in mind as he decides how to handle this crisis. The world community, Ukraine added, must put pressure on Russia to pull back its terrorists and allow Ukrainian and international experts to carry out their inquiry. Speaking in Kuala Lumpur, Malaysian Transport Minister Liow Tiong-lai said it would be "inhumane" if Malaysian experts would not be given access to the crash site. He also expressed concern that the site was not properly sealed and could be tampered with. Australian Prime Minister Tony Abbott said it was essential for investigators to get full access to the crash site. "Quite possibly there are attempts in place to sanitise the site. The site needs to be secure. The investigation needs to take place. And frankly anyone who tries to obstruct this is no friend of justice, is no friend of peace," he said. Russia has meanwhile hit back at the West, accusing it of waging an information war against Moscow. The defence ministry challenged Ukraine to produce details of what its anti-aircraft systems were doing at the time of the crash. A team of international observers said the rebels had limited their access to the wreckage. An OSCE spokesman said on Friday that access to the site had been controlled by armed men, with one firing shots into the air. Both Ukraine and the rebels have accused each other of shooting it down. Ukraine's government called the disaster an "act of terrorism" and released what they say are intercepted phone conversations that proved the plane was shot down by separatists. But the pro-Russian separatists said a Ukrainian air force jet had brought down the airliner.